True-to-life photos and color accuracy. 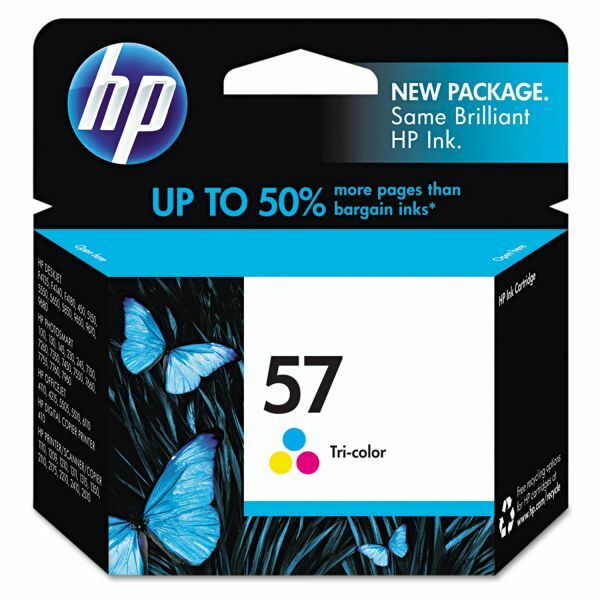 HP inks engineered to ensure compatibility with all printing system components. 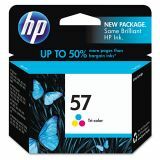 HP 57, (C6657AN) Tri-color Original Ink Cartridge - HP 57 ink cartridge contains patented, dye-based inks formulated to produce true-to-life photos every time. This cartridge produces very fine five picoliter drops that create the precise image detail and color accuracy of true-to-life photos on a wide range of paper. Photos printed using this cartridge resist fading for generations. Cartridge is designed for use with Hewlett-Packard Deskjet 450ci, 450cbi, 450wbt, F4135, F4140, F4180, 5150, 5150w, 5550, 5650, 5650w, 5850, 5850w, 9650, 9670, 9680; Digital Copier 410; Officejet 4110, 4110v, 4110xi, 4215, 4215v, 4215xi, 5505, 5510, 5510xi, 5510v, 6110, 6110xi; Photosmart 100, 130, 130xi, 145, 145v, 145xi, 230, 230v, 230xi, 245, 245v, 245xi, 7150, 7260, 7260v, 7260w, 7350, 7450, 7450v, 7450xi, 7550, 7660, 7660v, 7660w, 7755, 7760, 7760v, 7760w, 7960, 7960w, 1110, 1209, 1210, 1210v, 1210xi, 1311, 1315 Series, 1350 Series, 2110 Series, 2175 Series, 2210 Series, 2410 Series and 2510 Series. Cartridge yields approximately 500 pages.